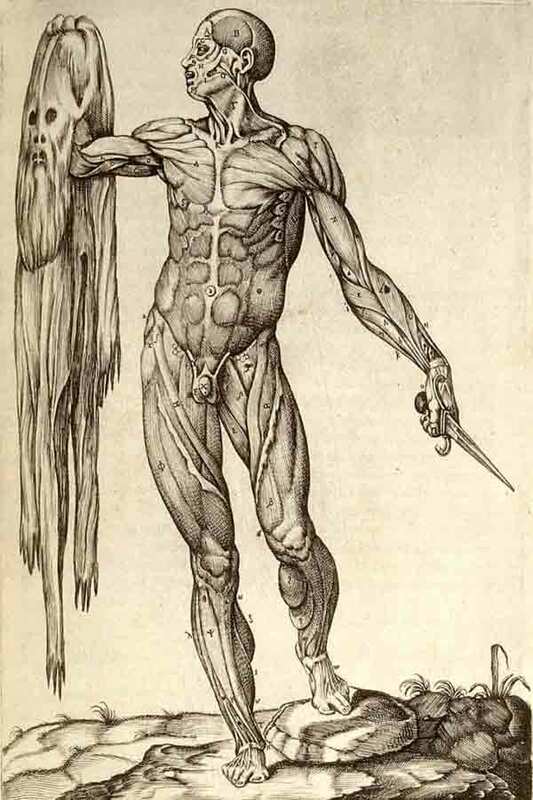 The word "cutaneous" simply means "skin" in Latin and is also called the integument which means “covering”. Different areas of the body will have various thickness between 1.5 to 4.0 millimeters (mm). ​Your skin's thickness varies in different areas of your body. Skin can be categorized as either thick skin or thin skin. Your thick skin is located in regions of your body that has a lot of physical contact with the outside world. These areas include your fingertips, your palms and the soles of your feet. These extra layers help to protect the soft tissues from abrasions. Thick skin differs from thin skin in its structure. While the epidermis is thicker in thick skin than in thin skin, but the layer of the dermis turns out to be thinner. Also, thick skin does not contain hairs, sebaceous glands, or sweat glands. 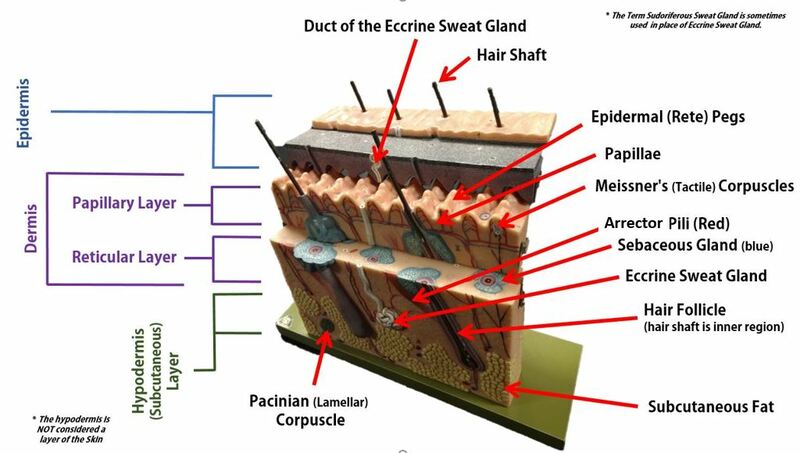 The epithelium of thick skin contains 5 epidermal layers, whereas thin skin contains only 4 layers. Epithelial tissue lines every surface of our bodies, inside and out. Our glands are also made up of epithelial tissue. The integumentary system performs a variety of functions. We may spend a lot of time preparing our dead skin cells to look their best for the world, but your skin and its accessory structures do much more than just give you an attractive face! Let's take a look at the ways your skin is hard at work to keep you movin' and groovin' throughout your day! 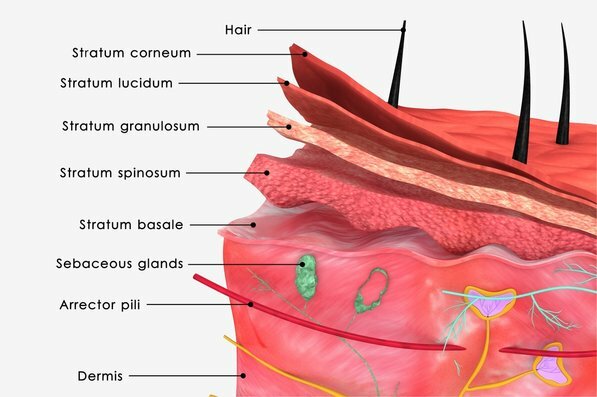 This is because the epidermis is composed of stratified squamous tissue which provides layers of small, squamous cells which are rapidly and easily replaced. The barrier of your skin also protects you from harmful elements like bacteria, viruses, chemicals and even contains melanin (within specialized cells called melanocytes) which provides protection from harmful UV radiation from the sun. Epithelial cells that produce secretions are called gland cells or glandular epithelial cells. Like any good cell, the gland cells will come together to form glandular epithelial tissues. Epithelial tissue assists in maintaining homeostasis. For example, sweat glands respond to heat by emitting secretions that reach the outer surface of the skin to keep us cool. The secretion of sweat, mucus, enzymes, and other products that are delivered by ducts come from the glandular epithelium. The outermost surface of your skin (the superficial region) is made of a thick epithelial tissue called epidermis. The word "derm" means "skin". The prefix "epi-" means "above". 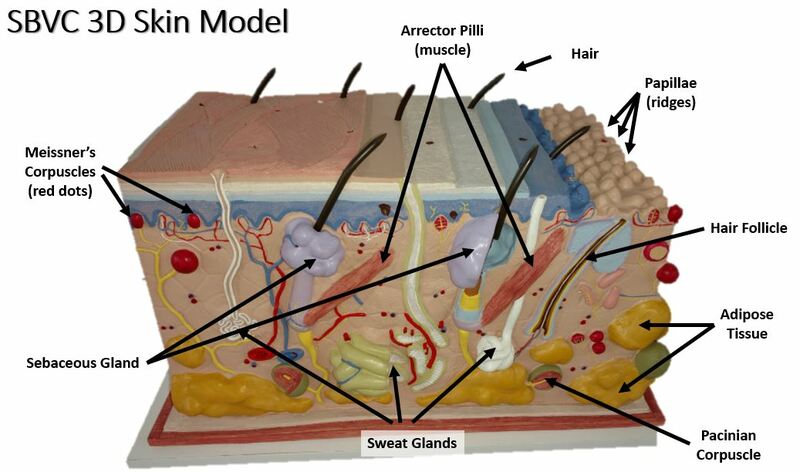 Beneath the epidermis, (deep to the epidermis) is the layer of the dermis. The dermis is composed of connective tissue. The skin is composed of the epidermis and the dermis. 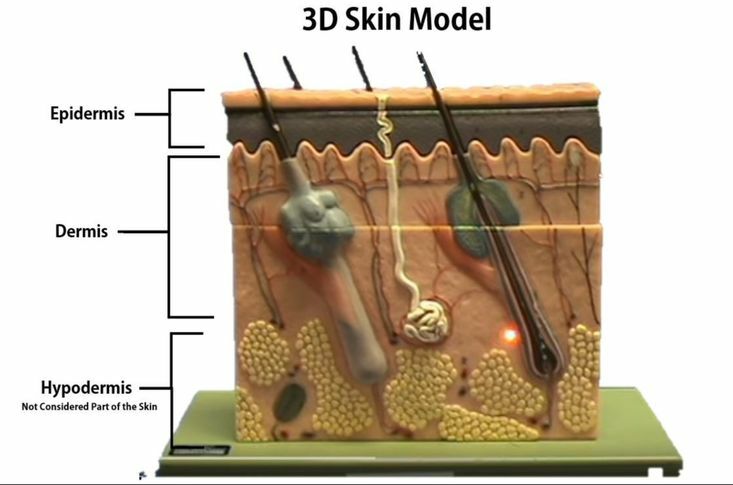 Below the skin (deep to the skin) there is another layer called the hypodermis. "Hypo-" means "below". This layer is composed of areolar connective tissue and adipose tissue. The hypodermis is NOT considered to be part of the skin itself. The beauty of the skin is more then SKIN DEEP! 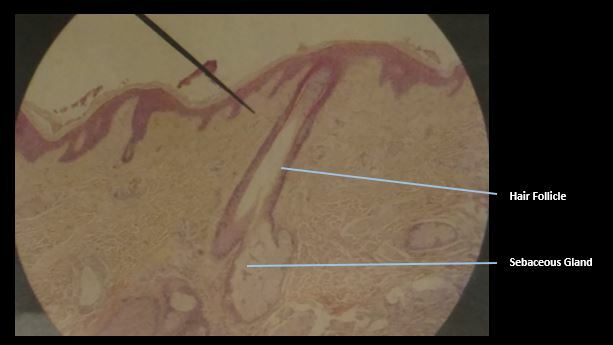 Epdermal tissue is categorized as a keratinized stratified squamous epithelial tissue. The most abundant type of cell found in the epidermis are keratinocytes. Keratinocytes produce keratin which is a fibrous protein that gives strength to epidermis. The keratin protects the deeper tissue layers not only by providing a physical barrier to the outside world, but they provide antibiotics. and enzymes that act to detoxify the harmful chemicals to which our skin is exposed. Keratinocytes form in the deepest portion of the epithelium (the stratum basale) and then are continously pushed outward until they die and eventually get sloughed off of the body. We loose millions of these dead skin cells every day! your epidermis is completely replaced every 35-45 days. The keratinocytes undergo physical changes as they mature and move closer to the surace of your skin. The keratinocytes are created from stem cells that extist in the stratum basale. As these cells are pushed up by the production of new cells beneath them, they make theor way to higher (more apical) epithelial layers. When the keratinocytes reach the stratum spinosum (the layer superficial to the stratum basale) they begin to produce keratin. Once they reach the stratum granulosum, these cells are busy making lots of keratin which fills their cytoplasm. The keratinocytes begin to die as they become part of the stratum lucidum, becoming smaller and clear. They begin to loose their organelles as they die. By the time these dead keratinized squamous epithelial cells reach the skin's surface, they are completely dead and are characterized as "corneocytes". The corneocytes are basically dead, flat sacs completely filled with fibrous keratin. 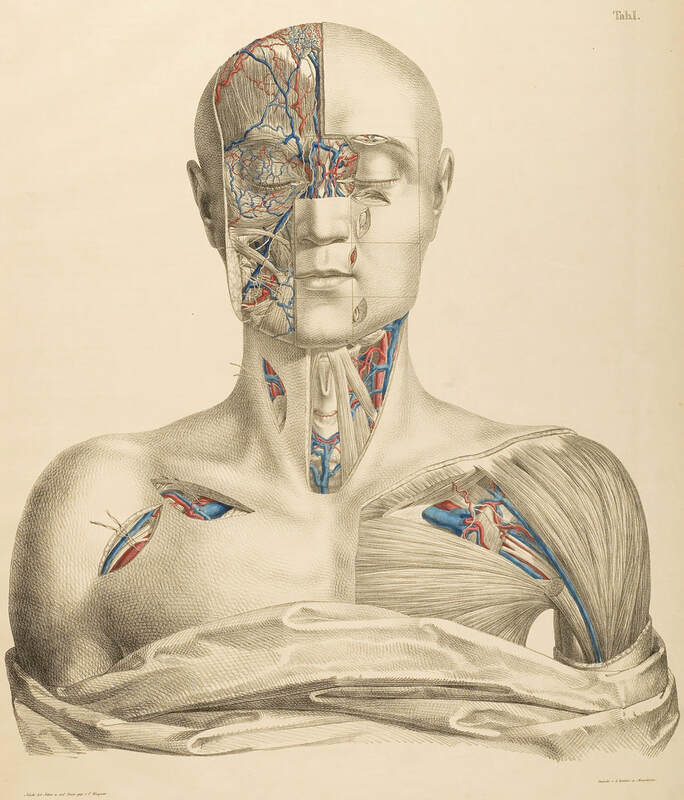 There are no blood vessels in the epidermis, so the epidermis does not have its own blood supply.The epidermis get nutrients and gasses , oxygen, and vitamins travel to the epidermis through the rete pegs, which are made up of a network of very small blood vessels that project down to the dermis layer. 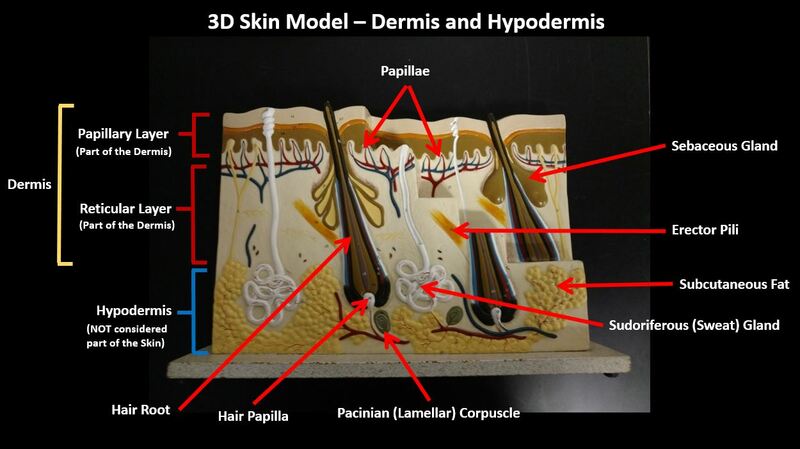 The epidermis consists of 5 layers in thick skin / 4 layers in thin skin. 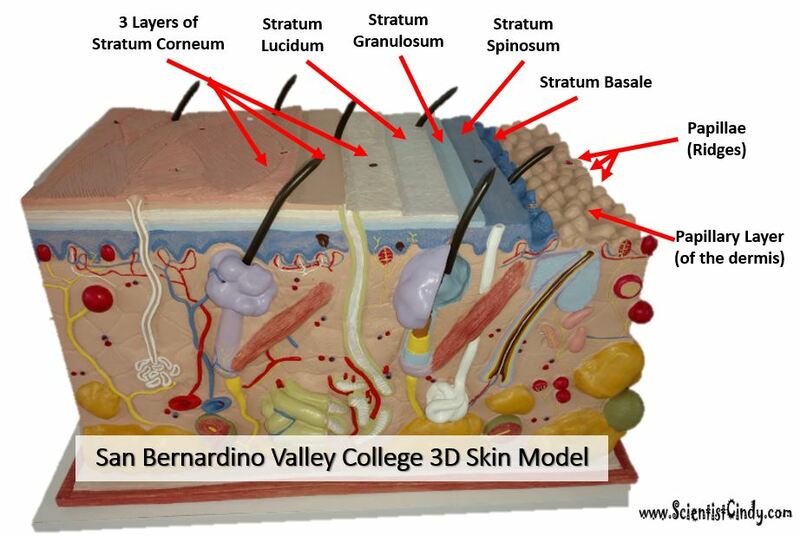 Stratum Corneum - Translates as "horny layer". Stratum Granulosum - Translates as "granular layer". Stratum Spinosum - Translates as "spinous layer/prickle cell layer". Stratum Basale - Translate as "basal layer". Need a Mnemonic?? Try, Come, Let's Get SunBurned! (HINT: they go in alphabetical order). The stratum corneum is Latin for 'horny layer'. Its odd name comes from the dead squamous cells called corneocytes that make up the apical surface of the tissue. The corneocytes form several layers of flattened (squamous) cells with no nuclei and no organelles. This is the layer that includes the final keratin product, which is a combination of cytokeratin and keratohyaline. The stratum lucidum is Latin for "clear layer". 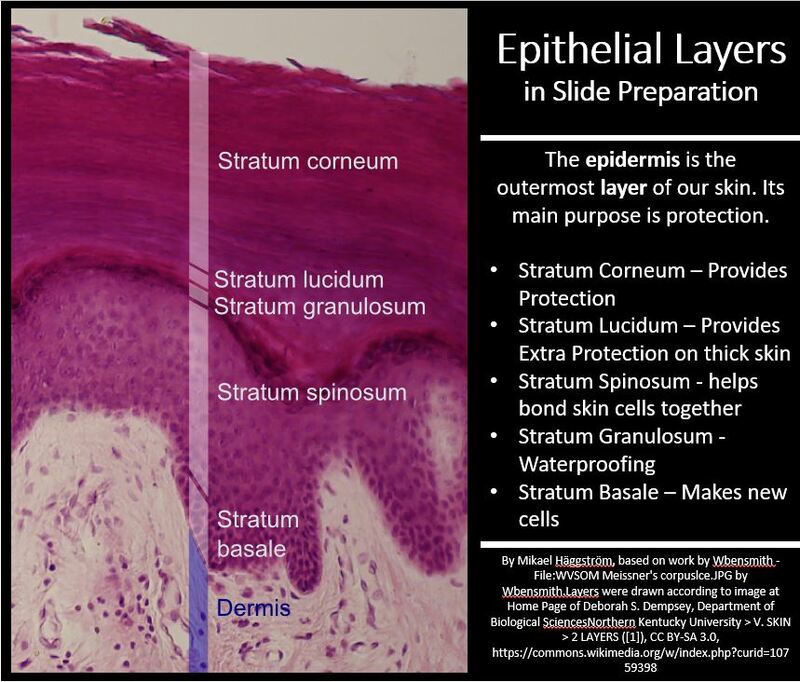 This epidermal layer gets its name from translucent appearance of the dead skin cells that make it up. *This layer only exists in the thick skin of the soles of your feet, your palms and your fingertips. The stratum granulosum is Latin for granular layer. 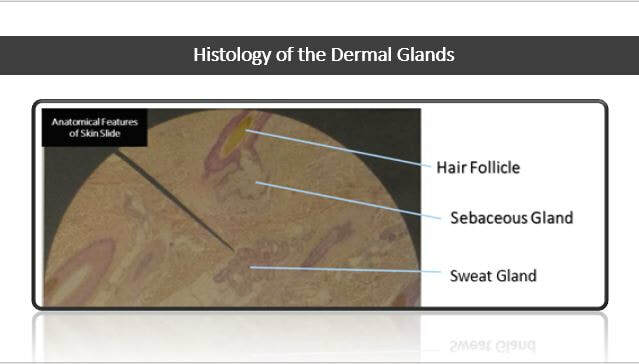 In this layer, the keratinocytes have become squamous cells that contain granules of keratohyaline, a precursor to the extracellular keratin that protects the skin tissue from abrasion. The stratum spinosum is Latin for "spiny". After forming in the basal cell layer, keratinocytes migrate upwards to form the stratum spinosum. In this layer, they develop short projections that attach via desmosomes to adjacent cells. The stratum spinosum is also known as the "prickly layer" because of these characteristic spines. The cells in this layer produce cytokeratin, an intermediate filament precursor to keratin.The cells in this layer experiences shrinking of its microfilaments during the slide staining process. 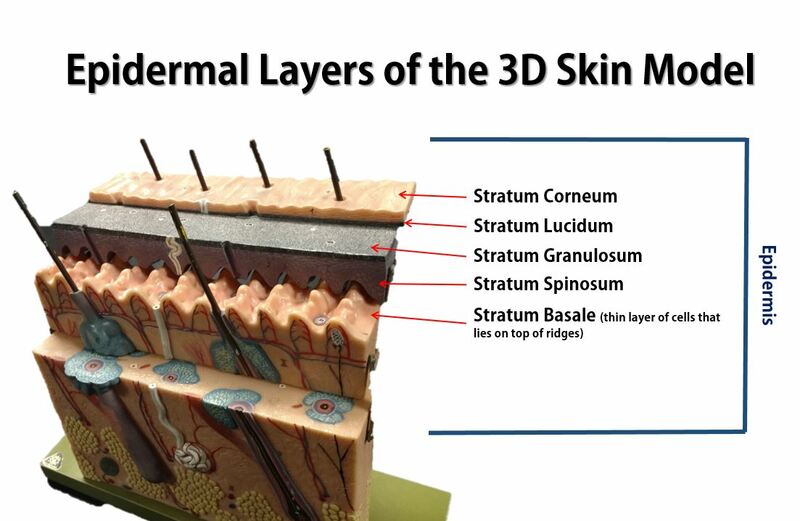 The stratum basale is the deepest of the 5 epidermal layers. The primary cell of the epidermis is the keratinocyte stem cells which give a continuous supply of new cells to replace old dead ones. The stratum basale also contain sensory nerves called Meissner's (Tactile) Corpuscles that are sensitive to light tactile sensations (light touch). This layer also contains melaocytes which produce the pigment melanin which acts to filter out harmful UV radiation. The epidermis is characterized as keratinized stratified squamous epithelium. 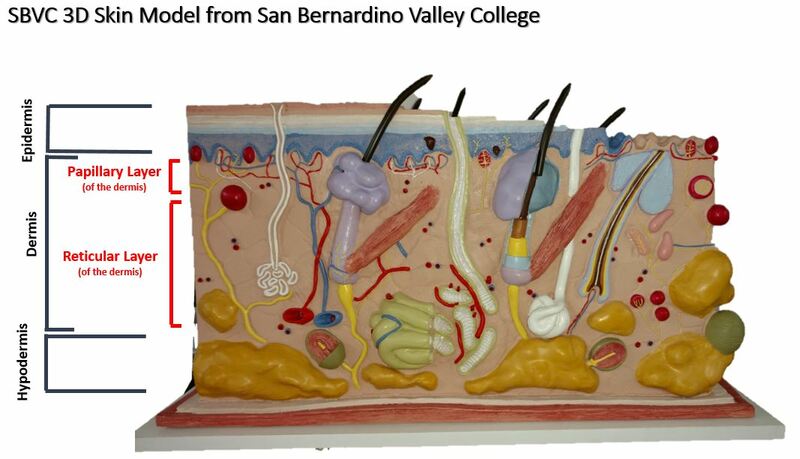 The picture below is a close up of the epidermal region of our 3D skin model. Melanocytes are specialized cells that lie within the skin. They produce a brown pigment (melanin) that functions to provide protection from damaging UV radiation from the sun. The pigment filters out the UV light. When your skin is exposed to more sunlight, your melanocyte darken the skin by increasing the production of melanin. 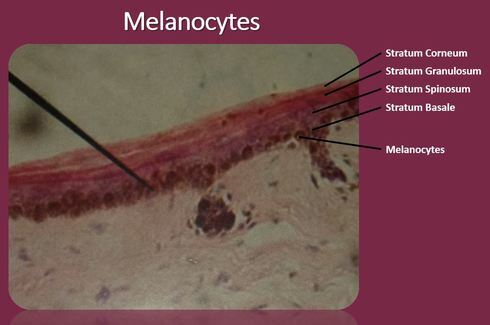 Melanocytes - make melanin - makes skin dark. Protects from UV Light. UV light is carcinogenic. This is why getting too much sun can cause skin cancer.